There have been a few reports of problems uploading to the scanner with versions 00.41 and 00.42. The main symptom was that after uploading, the scanner would briefly show "Data Error" and would reinitialize to its blank factory state. I was able to reproduce the problem, but only intermittently. I have not seen the problem at all in version 00.43. This is somewhat confusing, as there were no changes that should have "fixed" it. Likewise, there was nothing in 00.41 or 00.42 that should have caused the problem in the first place. 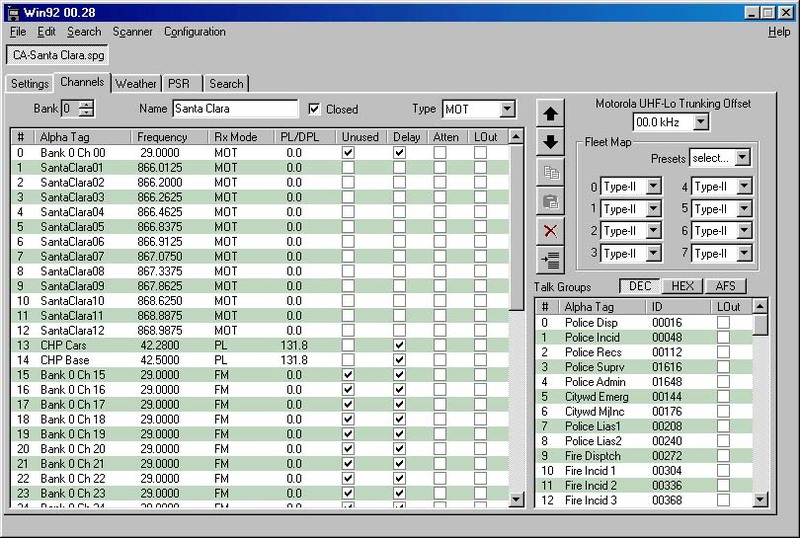 Win92 is a Windows "GUI" application for the Radio Shack Pro-92 trunking scanner. It allows you to read data from the scanner, make changes via the GUI, and write the modified data back. It will read / write the scanner in less than 90 seconds. You can also maintain a "library" of data files to be downloaded or shared. Win92 uses the 'standard' SPG data format for its files. Fixed a bug in the Step Size validation in the Search tab. Read errors: Some users that have experienced the "timed out waiting for 01 98 ..." error have been able to resolve it by downloading the DLLs.ZIP file. There is a download link for that file in the paragraph below the main program's download link. Windows 2000 Many people have reported problems transferring data to and from the scanner on Windows 2000 machines. Win92 was developed on a Windows 98 machine and has been tested on Windows 95 and Windows NT. Unfortunately, I don't have access to a Windows 2000 PC at the moment, so I cannot debug this problem. As soon as I can get my hands on such a PC, I'll look into it. Update 02 Dec 2001: This should be working now in version 0.30. Ken Plotkin (author of 92ware) and I have noticed a problem in both of our programs where after several downloads, we'll start dropping data from the scanner. We're still looking into it. At the moment, the workaround is to turn off both the scanner and the PC, disconnect the cable from them, and then power-up and reconnect. Win92 is released as freeware. You may download it for personal use only. It may not be sold or used in any commercial enterprise. All rights to the software are retained by the author. No guarantee is made as to its usefulness or fitness for any purpose. The author will not be responsible for any damage to any equipment or data resulting from the program's use. The link above is the program only - it doesn't include a couple of system files that are required to run it. If you're using a recent version of any Microsoft product, then you should already have these files. If Win92 complains that it can't find a file or component necessary to run (or something like that), you can get the required files here. This file is a WinZip archive containing the required components. Merely put it in the same directory/folder where you put the Win92.exe program, and "unzip" it (as with the Win92.zip file, you'll need WinZip or an equivalent utility to do this). The archive contains three new files: MFC42.DLL, MSVCRT.DLL, and MSVCP60.DLL. You can then delete the DLLs.zip file. This page is going to be relatively "terse", only including a description of changes from release to release, as well as a list of any known or reported problems with the application. If you use the program and find a problem or have a question, check back here to see if it's already been reported (and maybe fixed). Currently, the Search page is kind of buggy in that it lets you enter lockout frequencies that are outside the actual search range. But, I've been warned about making too many checks for things like this, so I might leave it alone. For frequencies that are not used, the Pro-92 shows 0.0000 MHz. The Win92 program will interpret the frequency data as if the channel was used (showing 29.0000 MHz) and will have a check box that shows that the channel is unused. I decided to do it this way (instead of displaying 0.0000 MHz), so that if you'd entered a frequency value into a channel, then clicked the Unused checkbox for that channel, you wouldn't wipe out the frequency information. If you upload such information to the scanner, it will show 0.0000 MHz for the channel. Other fields that can be either "unused" or "not applicable" (e.g. PL codes in an FM channel) are handled similarly. On the Bank page, you can select preset fleet maps. These are the E1P1 - E1P16 maps found in the back of the Pro-92 manual and in Uniden TrunkTracker manuals. Thanks to Bill P. for the suggestion. On the PSR ("Preprogrammed Search Ranges") page, you can copy PSR entries into the 10 search ranges. Click on the PSR entry, then click on the search entry (bottom right of the PSR page) you want to replace. Click the "Copy to Search Bank" button. On the Bank page, Talk Group IDs will be formatted according to the Bank Type, Fleet Map entries, and the DEC, HEX, and AFS buttons (AFS is only functional for EDACS banks - in non-EDACS banks it will cause a decimal display). LTR IDs have dashes inserted for spacing purposes (e.g. A-HH-III, where A is the Area Code, HH is the home repeater, and III is the user ID). The DEC, HEX, and AFS buttons have no effect on LTR or Mot Type-I IDs. To set the priority channel to one of the Weather channels, use "channels" 1000 to 1009. These represent Weather 0 through Weather 9. When the program is first started, it attempts to load the last SPG file that was opened or saved. If this fails, all fields are populated with data that represents the Pro-92 in its blank (fresh-out-of-the-box) state. The "New Template" function will create this data, as well. More info will be added under this "General information" heading as users ask questions or have comments. Paste previously-copied channels or talk group IDs to current bank and selection. Note: you can't copy/paste within the same bank - use the 'move' buttons for this. Play with these a little bit to see how they work. Changed the serial read code (downloads) to not use so much CPU time. This was a fix that didn't make it over from Win93/95 in version 00.44. Changed the serial read and write code to more closely mirror that in Win93 and Win95. This fixed (for me) the read timeout errors when using a USB adapter. Moved a lot of the program's code into a common DLL that's used by the other WinXX programs. The DLL, included in the ZIP file, must be in the same folder as the Win92.exe file (or somewhere in the path, like Windows\System). I highly recommend that you put the DLL with the EXE. Fixed a bug in the serial readback code that would cause uploads to fail. Miscellaneous cleanups. A few speed optimizations in rendering the displays (a prelude to incorporating the Win93 enhancements later on). Fixed a bug in the interpretation / display of LTR talkgroup IDs. This was forwarded to me from information at Strong Signals. I don't have an LTR system with which to test it, but I have verified that the data you enter in Win92 now shows up correctly in the scanner, and vice-versa. The problem was that an ID such as 105132, entered into Win92 as 1-05-132, would show up in the scanner as 005132. Fixed a few bugs in the copy/paste/delete code. Made the frequency format used in copy/paste more compatible with Win93. Fixed a bug that caused a crash if you tried to "delete" one of the empty PSRs at the end of the list. Added an "Add Item" button to the PSR page. This button will add a new, blank entry to the end of the PSR list. This function is in addition to the existing "Insert" button, which lets you insert a new item into the middle of the list. (The "Add" function was created in order to alleviate some apparent confusion about the ability to add new items via the Insert button). Fixed (I hope) problems with Windows 2000 (and XP). I've tested this a bit on a Windows 2000 Professional system, and it appears to work well. Fixed a bug in the PSR page that misinterpreted frequencies, causing an error message if you edited them. Added the ability to save a text file. Replace all main window buttons and boxes with a menu. Added the ability to copy/paste from and to external applications (e.g. Excel, Word). Fixed a bug that would say Talk Group IDs are invalid for MOT banks when the AFS button is selected. Version 0.25 28 August 2001, 21:55 PDT. Version 0.24 28 August 2001, 19:00 PDT. You can now have multiple files (up to 10) open at once. You may copy / paste across files (Channels and Talk Group IDs only). The program will now prompt you if you try to close a file or exit the program without saving your changes. Changed the "Reset Data" button to read "New Template". This is because it creates a new, blank data object instead of just clearing out the current data. Version 0.23 28 August 2001, 10:30 PDT. Added the ability to save a "partial file", that only contains the data you specify. You can select from: channel banks (any or all of them), search banks (any or all), weather, PSRs, and main settings. When loading such a file that contains channel or search banks, you may specify where you want to load the data. This feature should make it easier to move data around between files. For example, you could save channel banks 3 and 5 from one SPG file, then load them into another SPG file, but into banks 9 and 6. Also added the ability to select multiple items in the PSR page (for moving and deleting). Column widths are now saved in the INI file, so if you change them, they will be restored the next time you run the program. Version 0.22 24 August 2001, 18:15 PDT. The program now auto-sizes, and can have scroll bars. This is mainly for users on whose displays Win92 didn't fit. Also fixed a bug in the copy/paste/move code where unsaved edits would be undone. Fixed a bug in the move up/down code that kept the last entry in a list from moving. Version 0.21 24 August 2001, 22:45 PDT. It looks like the RTS high introduced in version 0.20 has hurt some users by making their scanner downloads fail. This new version defaults to RTS LOW and allows you to set it HIGH with a check box under the COM port selection. If you have problems downloading, click on this check box to toggle the state of RTS and try again. Version 0.19 Made list columns resizable. COM port, last directory, and last SPG file are now saved on program exit and loaded on program start. The last active SPG file is also loaded on program start. Renamed some main control buttons to avoid some confusion. Fix for a communications problem under Windows NT (lock up when uploading to scanner). Thanks to David S. for some of the feature feedback. Version 0.18 Fixed a problem with Type-I talk group IDs, where Win92 was setting the 'UserID' bits to zero instead of one. This was keeping the scanner from correctly tracking Type-I systems. Thanks to Eric F. for the bug feedback. Version 0.17 Added Channel/Row Numbers to all of the lists (except Search Lockouts). Cleaned up the display when you switch banks, load SPGs, and read from the scanner - it's faster and prettier (no longer shows the "filling" of the lists). Now checks the priority channel, to make sure its receive mode isn't LTR, MOT, or EDACS. Version 0.16 Allowed click & drag changing of 'check box' items in the lists (e.g. Unused, Atten, LOut, Delay). Just click on one and move up or down in the column. All that you hit will be toggled. Version 0.15 Added Fleet Map presets (e.g. E1P1, E1P2, etc.). Version 0.14 Allowed keypad beep to be 300 - 10000 Hz. In Search page, allowed any non-zero step size that is a multiple of the Start frequency's step size (i.e. 5 or 12.5 kHz). Added AFS display to Talk Group IDs for EDACS banks. (Selecting AFS for a 'Conv' or 'MOT' bank will just show decimal). Thanks to Ken Plotkin and Bill Petrowsky for information on the Pro-92's data layout, especially Type-I fleet maps and size codes!